p. 36 Cocktail therapy = “Dim Sum Therapy” Dim sum (/ˈdɪmˈsʌm/) refers to a style of Southern Chinesee (Cantonese) meal prepared as small bite-sized or individual portions of food traditionally served on small plates in small portions, much like Tapas. Each individual around a meal can pick from what he/she likes and eat as much or little as he/she likes of any item. It is a tailored or personal meal where the choice of food (therapy) is large and one can take nibbles of each to fulfil one’s appetite. I believe I am first to coin the term “dim sum therapy” for a low dose but diverse array treatment strategy for cancer to replace the conventional monolithic “dose dense” sequential approach to treatment, with equal or superior efficacy, more possibility for personalization, as well as reduced toxicity. p. 36 There are many examples of the superiority of a cocktail approach in medicine besides in TCM and HIV. A brief overview was recently presented by Ascierto and Marincol of the “Istituto Nazionale per lo Studio e la Cura dei Tumori” in Naples, Italy: “Combination therapy: the next opportunity and challenge of medicine” in J Transl Med. 2011; 9:11. The Italian authors presented tuberculosis as a classical example of combination treatment. They also cited the advent of novel therapies for trasnplant medicine with improved efficacy and reduced toxicity. One interesting point that the authors made was the challenge to test novel combinations for drugs that have not yet been licensed. They pointed out that clinical trials are often influenced by the financial pressure and that there are drugs that risk being withdrawn from research by early negative clinical results. Such single-drugs failures may prove useful in combinations, and it may be important to rescue “failed” drugs in combination with potentially synergistic mechanisms of action. An example is the combination of interferon-alpha and ribavarin, two drugs that alone demonstrated minimal benefit, but are effective in combination treatment of hepatitis C. Finally,we are creating a subsection of the Journal of Translational Medicine dedicated to combination strategies as a forum to stimulate discussion between academia, industry and other institutions in order to emphasis the identification of clinical trial strategies utilizing combinations of treatments. p. 36 A well known one is actually called the “Brompton Cocktail”. The cocktail was invented at the Royal Brompton Hospital for use in TB patients in the 1920s. It is an elixir for pain which was frequently administered to terminal cancer patients. There are different formulations, but the classic one usually calls for a variable amount of morphine, 10 mg of cocaine, 2.5 ml of 98% ethyl alcohol (sometimes gin is substituted), 5 mL of syrup BP, chlorpromazine and a variable amount of chloroform water. While the main ingredient is morphine or an opioid for pain, it is generally acknowledged that the whole is greater than the sum of its parts with various active ingredients all potentiating the morphine or other opioid. The synergy between opioid analgesics and centrally-acting stimulants is well-known: e.g. the caffeine content of many codeine-based pain relievers, both to combat the somnolence from the painkillers and to boost their pain-killing ability. The tricyclic chlorpromazine improves the efficacy of the opioid. The choloroform water is to improve the taste. 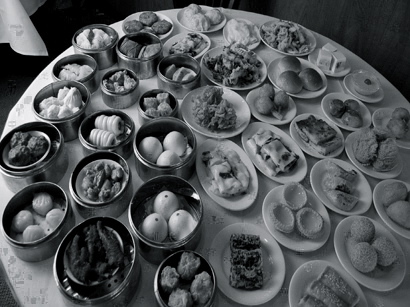 I have always liked Dim Sum. One of the challenges is to select the best combination of choices that best suit you. With cancer one is best informed by experts such as yourself and the literature. I found your book to be logical and insightful. I believe you are on to something important. You and Ben Williams have focussed on the patient more than conventional system and its soldiers do. I live in a smallish town in New Zealand and my wife has refractory ovarian cancer. The cancer is aggressive and is winning despite our efforts supported by an alternative specialist here. IV vitamin C, diet and hyperbaric O2 is one treatment. Our next move is an off label combination. First, there is the obvious need for a stronger revolution in ethical practice ensuring that the patient’s best interest is first above rigid generalised and cruel scientific protocols. Ironically, those in power can start to do this by adding an overiding protocol enforcing or at least encouaging much more flexibility in practice and provision of useful information for patients and their families where conventional treatment does not have a high chance of success, eg refractory cancer. The FDA is softly and weakly moving in this direction. Much more is needed and the bar should be much lower than this to help ensure that patients get informed patient choice at early stages of cancer diagnosis. The entrenched legal and other disincentives to freeing up the system must be overcome, and as you imply, the patient’s voice must be louder and together. What is needed is a revolution not a slow crawl in the right direction. I am thinking how to help that. Apart from the ethical and system barriers, (as if the sick patient doesn’t have enough to cope with), it does seem like we want more help choosing what to have in our Dim Sum cocktail. A patient is often emotional and wanting anything that might give them a chance but is then struck by a multitude of different options and advice on the net most of which won’t work. First, they need a good specialist who can listen and advise, but even that is hard to choose or locate, especially for the average person. The trend towards genetic, individualized analysis, CTC analysis and so on can now (or if not now then maybe soon) augment expert advice and studies to help the patient/health professional to pick the best combination of off-label and botanicals and potentially other treatments better targeted for them personally. I am trying a CTC analysis even though there are of course some limitations with it. You have elsewhere talked about personalised analysis and some issues with it, but maybe we can select a better menu personlised to our tatses with some tweaking personalised analysis has the potential to synergise with the cocktail approach – providing the heath professional and patient with some information that could help achieve the tipping point to beat cancer, while millions of people are sacrificed for the sake of cruel scientific dogma.